Donna Alward wrote some of my favourite category romances and seeing her back in “category-form” was most welcome. Alward writes romance for adults and it was disappointing to see her venture into imaginery-royal-kingdom territory in her past few books. While previous books have consistently been bedroom-tame, I think the classic Harlequin romance line results in a good fit. Jennifer Hayward’s Married For His One-Night Heir started out very conventionally HP-ish, but that’s not how it developped, or where it ended up, though I assure you the HEA is front and centre. I like to pepper my reading with the occasional HP, especially when it’s written by a writer as adept as Hayward (gosh, I do miss Morgan’s HPs). And this appeared, at first, to give me the same-same. Warning to those who don’t like’em: heroine Giovanna “Gia” Castiglione, aka De Luca, has been hiding out in the Bahamas with her three-year-old son Leo after her mobster husband Franco was killed in Las Vegas. Leo, however, is not Franco’s son, but the hero’s, Santo Di Fiore’s. When Santo and Gia reunite at a party given by Gia’s boss, Delilah Rothschild, it isn’t long before Santo figures out that Leo is his son, the result of one passionate night with Gia. The morning after that night, despite Santo’s pleas to defy her mobster father and stay with him, Gia left, scared for Santo, scared for herself, and in thrall to her dangerous, powerful father. 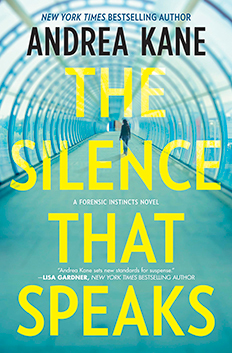 TEENY-TINY REVIEW: Andrea Kane’s THE SILENCE THAT SPEAKS Didn’t Speak To Miss B.